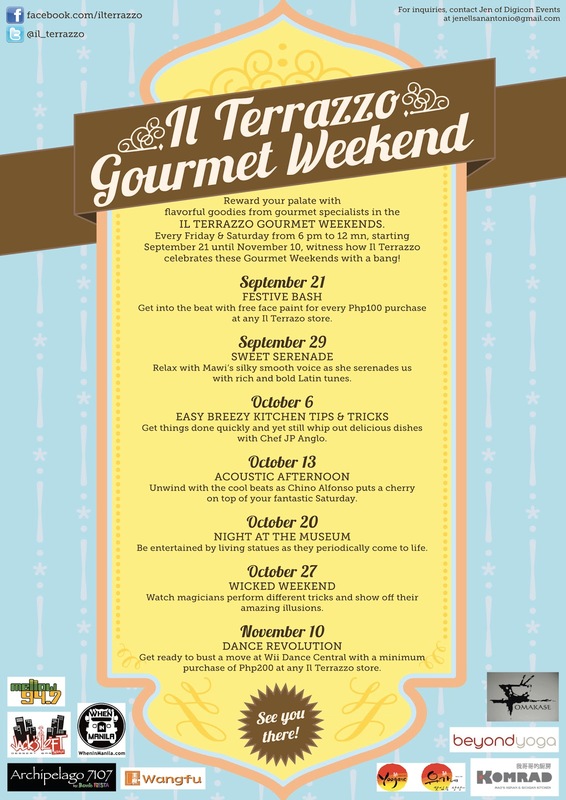 As part of it’s thrust of being the number one lifestyle hub in Tomas Morato, Il Terrazzo brings another fun-filled and tummy-filling activity, the Gourmet Weekend Series. Starting September 21 until November 10, every Friday and Saturday, you will have another reason to invade Il Terrazzo as gourmet specialists and start-up food entrepreneurs pop up and open their tents to serve up their specialties. Aside from the gourmet offerings, each week you will sure to enjoy their lineup of treats and entertainment, like live performances, and talks from guest chefs. You can check the poster to see the full list of what’s in store for you in Il Terrazzo every weekend. So don’t miss out on the opportunity to reward yourself with good food in a unique food funfair and gourmet experience! Confident. Achiever. Responsible. Witty. Sensitive. Passionate. Committed. Meet the new breed of pogi. These days, being pogi is more than just having naturally good looks, it’s about having the right attitude that truly makes the difference. 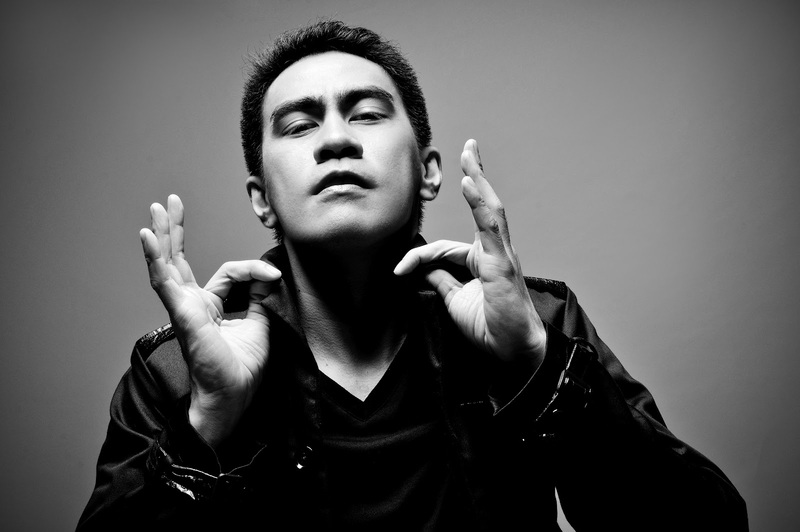 And leave it to internet action star Ramon Bautista to show us what being pogi is all about. A multi-talented achiever, comedian, filmmaker, producer and U.P. film professor, he proves that it’s the character and confidence that makes the man. After all, a handsome man is but an empty shell for a big personality! So don’t just be a pretty face, be #LikeAPogi! Just like Ramon, put your personality at the forefront and charm your way to the top with wit, humor, and dashing confidence just #LikeAPogi! Follow Like A Pogi on Twitter here. Follow Like A Pogi on Instagram, too! Everyday is a fresh start, a fresh new brew. Every morning, inside a Moonleaf shop, tea leaves are brewed to perfection specifically for your favorite milk tea drinks. For some of you, Moonleaf is where things start for the day. Or maybe you're craving for a sweet drink before cozying up in your bed? Get that sweet fix from your favorite Moonleaf milk tea creation. You can even invite friends to come over for a quick night cap. Use #moonleaffirstcall #moonleaflastcall for a chance to be part of their 2013 Moonleaf Planner! You can send your entries up until September 23. Post your #moonleaffirstcall #moonleaflastcall photos now! Don't you guys love bazaars? There you can haggle clothes, accessories, shoes and everything under the sun at one place, right? That's why this November, we invite everyone to support "Bazaar For All Season" at Elements Tent at Centris. Happening on November 3 to 4, 2012 (Saturday to Sunday). Meet your favorite bloggers, shop 'til you drop, mingle with friends and check out the latest trends! Wrangler leads you to explore a boundless adventure with a new-found freedom and energy by introducing its new advertising campaign, "Find Your Edge - Boundless Traveler" in the Fall/Winter of 2012. The Boundless Traveler demonstrates a free spirit on the open road who knows no boundaries. It is about exploring, feeling alive, going on adventures, and embracing unlimited possibilities. Modern, functional and utilitarian outfits are the best companion on the way to the Boundless City. Throw on a cape or a jacket, with details such as zips and strings, in navy blue, viridis and biking red. Pair them with Wrangler's packable reversible series, cargo shorts, organic denim and acid wash jeans. As evening unfolds, neon lights start to dominate the city at Midnight. It's time to dress up, hit the road and party with hints of metallic and shimmer to stand out from the crowd. Anchored by its denim heritage, Wrangler aims to create contemporary outdoor looks fit for travelers. Check out the Wrangler Fall/Winter 2012 collection at Wrangler boutiques and leading department stores nationwide! 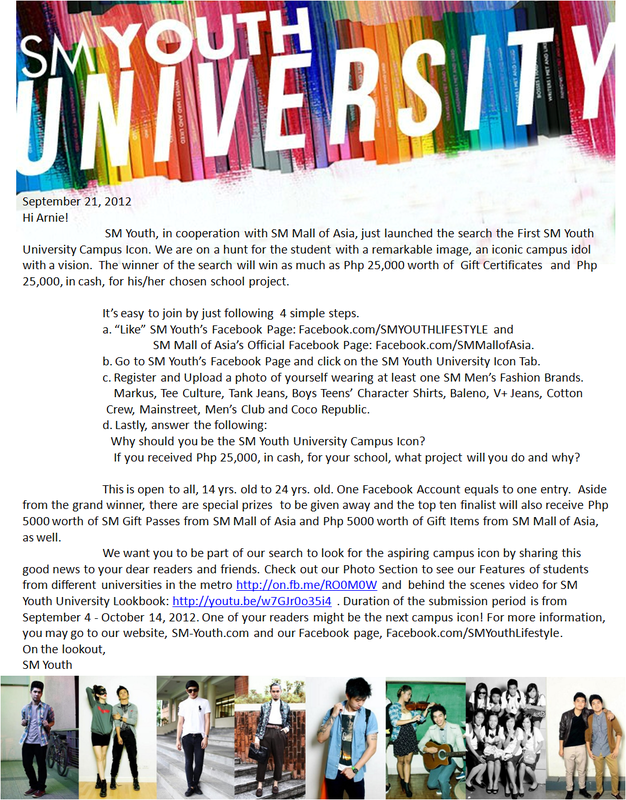 SM Youth recently launched the first ever SM Youth University Campus Icon and they're looking for a student (14 yrs. old to 24 yrs. old) with a remarkable image, an iconic campus idol with a vision. 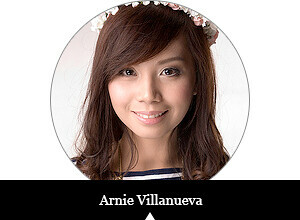 He/She can win as much as Php 25,000 worth of gift certificates and Php 25,000 in cash for his/her chosen school project. Fashionistas from around the metro are getting a glamorous taste of Philippine fashion on September 27, 2012 as John Paras unveils another fine collection for the Privé Style Series. Hosted by the Privé Luxury Club, the Privé Style Series is a monthly stylish bash where the country’s best fashion designers showcase a capsule collection created just for the event itself. This month, John Paras’s muses will be basking in the luxury of his creations as they walk down the ramp in bespoke gold-and-black cocktail dresses. Headlining the show are Frencheska Farr and Julie Ann San Jose, two singing sensations from GMA Artists Center. Frencheska Farr got her start in show business when she wowed the country with her amazing vocal range in Are You The Next Big Star?, where she won the grand championship alongside Geoff Taylor. While singing has always been her main strength, she also earned accolades from acting in TV shows and movies, and balances her budding career doing both. Julie Anne San Jose is another name to watch out for. Loved by the teenage crowd for her upbeat personality and versatile singing style, Julie Ann is known for putting unique and creative twists on pop song covers. Her cover of Nicki Minaj’s Super Bass has over 15 million views on YouTube and her self-titled album reached Gold Record status less than a month after it was released. Fans should stay tuned to her Twitter and Instagram accounts to see her walk in a John Paras brocade dress at Privé. 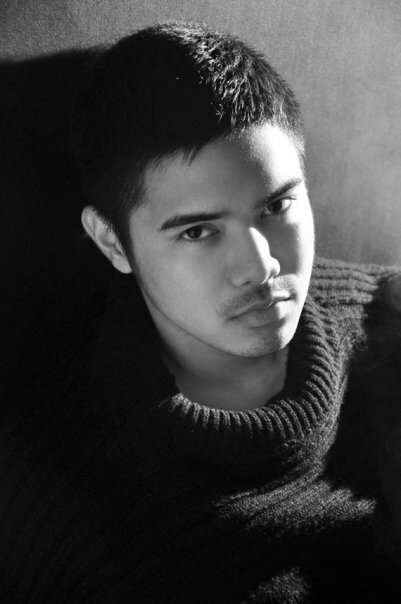 In addition to these musical divas, John Paras’s muses include Monique Jamlang, Reshma Chulani, Lisa Ugarte, Angelique La'O, Cheryl Tiu, Jerika Ejercito, Phoemela Baranda, Claudine Trillo, and Princess Violago Dee. “My muses give off an air of mystique and have an appreciation of the past,” John says. “She’s fun, confident, with a personality that stands out.” With a line-up muses like this fueling his inspiration, there’s no doubt that John’s collection will be doing a lot of standing out itself. Can I Be Your Fairy?